Plastic packaging provider RPC Saeplast has launched a new reusable polyethylene (PE) container for food processing. Available with a 750l capacity, the new solution is offered in several colours, with or without a drain plug and lid. The container is an addition to RPC’s existing 630l and 875l options, and will provide more variety and flexibility in food transportation and storage to the customers. It can be customised with company logos and tracking options, such as barcodes, quick response (QR) codes or radio-frequency identification (RFID) technology. The RPC Saeplast PE range is suitable for supply chain handling in the meat and animal by-products industries. The containers feature a one-piece, triple-wall design that helps them to survive seven times longer than single-wall versions, as well as provides the user with easier and safer handling of products. Designed for easy cleaning and maintenance, the solution also features a solid inner core that prevents liquid absorption and growth of harmful bacteria. 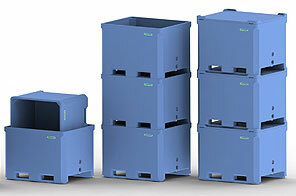 RPC’s new factory in Theeßen, Germany, has supplied the PAL container range to its customers from last month. The new offering includes containers featuring various colours, and sizes from 5l to 40l.